The busy marina area at Put-in-Bay, Ohio draws many visitors leaving for a day trip out to one of the neighboring islands or looking for a place to dock their own boats. Golf carts, the major mode of summer land transportation in Put-in-Bay, buzz along the main streets running by the marina. With so much activity, it can be easy to miss this historical marker standing near the docks. That broadcast helped cement de Forest's reputation as "The Father of Radio" and helped lead to many of the communication channels we take for granted today. The American inventor held over 180 patents and invented Audion, an early vacuum tube and the first electrical device capable of receiving and amplifying electrical signals. De Forest dominated electronics for nearly a half century, paving the way for radio broadcasting, television, sound movies and long-distance telephone phone service to become realities. De Forest coined the term "radio" to describe his early broadcasts as he disliked the term "wireless" that most people used during the early years of the 1900s. De Forest was a born tinkerer, and one of his early tinkering misadventures with came when the then-student at Yale managed to tap into the school's electrical system as he experimented. De Forest managed to throw the entire campus into a blackout and soon found himself suspended. Yale eventually let him back in, and he earned his bachelor's and doctorate degrees by 1899. De Forest's experimenting led inventing the Audion, but he wasn't really sure why it worked. He teamed up with a railroad dispatcher and telegraph operator in Toledo named Frank Butler after they met when Butler saw de Forest demonstrating how to broadcast telegraph signals the without the use of wires at the St. Louis World's Fair in 1904. The tinkerer and the telegrapher made a good team because Butler had a good understanding of why things worked as they did. The duo began racing other inventors to be the first to send voices over the air. They did a number of experimental broadcasts atop buildings in downtown Toledo, making the first real radio broadcast in the United States, and possibly, the world. 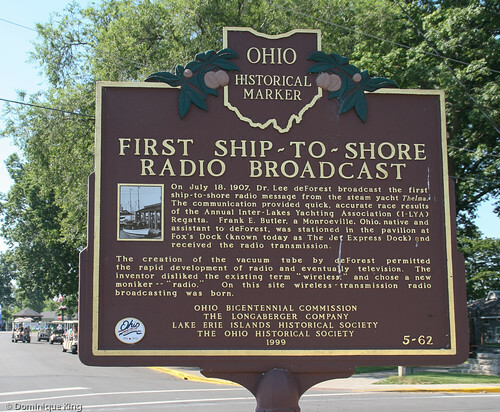 The pair took some primitive sending and receiving units for a real test at the regatta in Put-in-Bay They set up de Forest on a yacht called Thelma, and he broadcast results during the race to Butler on shore in what became the first ship-to-shore broadcast on July 18, 1907. Many people expressed skepticism about the broadcast, with some folks accusing de Forest and Butler outright of faking the story. Butler always fondly remembered working with de Forest, but he remained in Toledo to work as de Forest traveled the world and developed many more inventions over this lifetime. De Forest also spent a lot of his income defending his patents and defending against fraud (case ended in acquittal) in court. Among the more interesting recognitions earned by de Forest was an Academy Award in 1959/60 for his pioneering inventions that led to adding sound to motion pictures and a star with his name on the Hollywood Walk of Fame. He married four times, including his wedding to a silent film actress named Marie Mosquini in 1930. He remained married to Mosquini until his death in 1961. Another famous family member was his grandnephew, comedian Calvert DeForest, who played Larry "Bud" Melman for many years on David Letterman's late-night television show. Want to learn more about Lee de Forest? Check out Lee de Forest: King of Radio, Television and Film by Mike Adams. 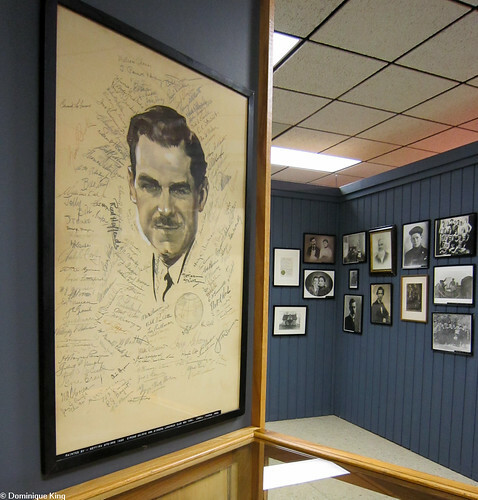 I remember seeing a couple Lowell Thomas books on my mother's shelves when I was quite young, but I never knew much about the pioneering broadcaster and world traveler until my recent visit to the Garst Museum in Greenville, Ohio. I vaguely knew Thomas as a globe-trotting journalist, but the museum's gallery dedicated to him gave me a new appreciation for his career as a multimedia pioneer. Considering Thomas' life-long fascination with emerging media and experimenting with it, I'm thinking he would be all over today's "new media", just as he was ubiquitous across multiple media platforms throughout his long career. Lowell Thomas was born on April 6, 1892 in nearby Woodington, Ohio. The museum moved Thomas' birthplace, a two-story Victorian house, to its campus during the late 1980s. Visitors can tour it during summer weekends, although we were there too early in the year to do so. 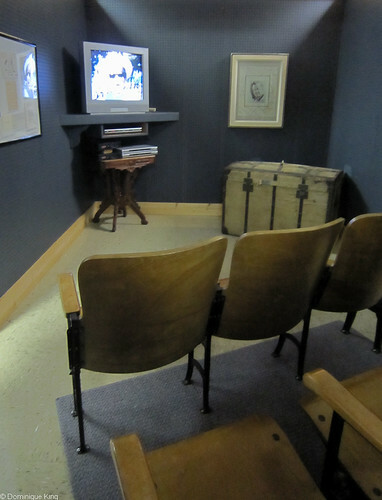 The museum's Lowell Thomas gallery has plenty of photos and mementos from Thomas' travels, and visitors can watch video footage of Thomas in a pocket-sized theater. The Thomas family moved from Ohio when Lowell was 8 years old, heading to Victor, Colorado, where his father was a doctor in the gold mining community. The Victor Lowell Thomas Museum celebrates Thomas's life and time there. Lowell started working for the Victor Daily Record as a newsboy at the age of 10, becoming an editor for the paper by the age of 19. Thomas earned degrees from five universities, including the University of Northern Indiana at Valparaiso and Princeton. Thomas continued working as an editor with dailies in Chicago and several other cities, but wanderlust soon kicked in and he began traveling the world in earnest by the late 1910s, filming and writing about his experiences in a nationally syndicated newspaper column. Thomas set out for Europe in 1917 with his new bride, Frances, and cameraman Harry Chase to report on World War I. He tired of harsh conditions and drab film footage he got at the Western Front, so his wife worked with the Red Cross in Italy while Thomas and his cameraman went to the Middle East. It was there that he met T.E. Lawrence, a young British Army officer who wore Arab robes as he helped lead Arab forces during the Arab Revolt against Ottoman Turkish rule. The colorful Lawrence captured Thomas' imagination, and the broadcaster's arguably romanticized accounts of the exploits of "Lawrence of Arabia" made Lawrence a star and made Thomas millions of dollars. Thomas created what was, for the time, highly original multimedia presentations where he narrated his travels from a podium in sync with photo slides and film clips. Lawrence's story intrigued 1920s audiences, and Thomas' presentations played to as many as four million people throughout the world. Thomas' 1924 book about the subject, With Lawrence of Arabia, became the first of over 50 books Thomas authored during his lifetime. Thomas began doing daily radio newscasts for NBC in 1930. His authoritative and impartial manner was a distinct departure from other popular radio newscasters of the time. Thomas decided to end each of his newscasts with a light-hearted story, a format that nearly every newscast since that time adopted. Movie audiences became familiar with Thomas' voice from the many short newsreels he narrated that ran in theaters to accompany feature films during the 1930s. Over the years at NBC, and later at CBS, he became the first newscaster to report from a ship, an airplane, a submarine, and a coal mine. In 1939, he simulcast his radio broadcasts on television, becoming the first to have a televised nightly newscast. Thomas appreciated the flexibility radio offered to broadcast from wherever he might be in the world, and he continued his nightly radio broadcasts until he was 85 years old in 1976. He produced and starred in television series during the 1950s and 1970s and became a Cinerama (3-D movie) producer. Check out the Internet Movie Database site for a listing of Thomas' work in movies and television. Thomas became rich working as an independent contractor with his own sponsors, buying his own time on networks, and retaining ownership of his material. Thomas' first wife, Frances, died in 1975, and the widowed Thomas married Marianna Munn of Darke County in 1977. In 1980, Thomas visited Ohio for the last time, to speak to the local Business and Professional Women's Club. He died in 1981 at his New York home at the age of 89. His widow Marianna returned to live in Dayton, Ohio, until her death at the age of 82 in 2010. Many of Thomas' books are out-of-print, but you can still readily find his first book, With Lawrence of Arabia, online. Want to learn more about Lawrence of Arabia? Check out Hero: The Life and Legend of Lawrence of Arabia by Michael Korda. I'm a huge fan of "Top Chef", and I loved the "Top Chef Masters" spinoff where 24 well-known chefs competed against each other to win $100,000 for the charity of their choice. 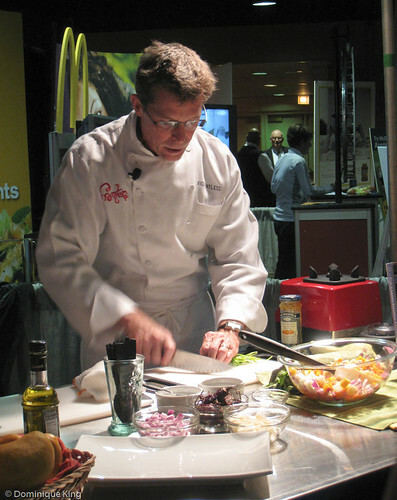 I went to the big BlogHer conference in Chicago just as the initial rounds of "Top Chef Masters" ended and the championship round was set to begin. 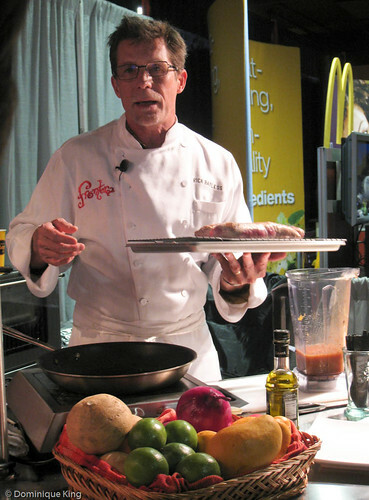 Renowned Chicago restaurateur and southwestern cuisine master, Rick Bayless, made it through the initial competition and was set to compete in "Top Chef Masters" finals as I attended BlogHer. I enjoyed watching Bayless compete, admiring his food and the fact that he seemed like a pretty down-to-earth guy. We've tried, and failed, to get into Bayless' insanely popular Topolobampo and Frontera Grill restaurants the last two times we've visited Chicago. Apparently, you have to make reservations at least a couple of weeks in advance, and we just haven't had that sort of in-advance planning time when we've visited the city. 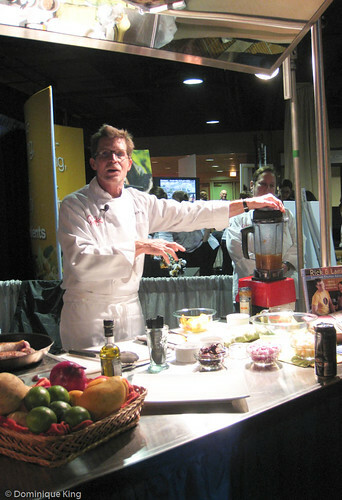 So, it was fun to spot Bayless in the BlogHer exhibition hall--giving a cooking demonstration! 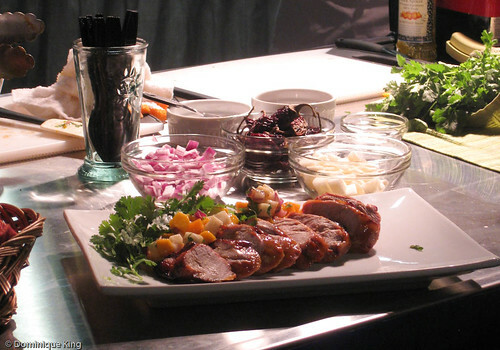 Bayless was at the National Pork Board booth, so he opted to do a fairly simple dish of pork tenderloin dressed with a chile-mango chutney. It was fun seeing Bayless work in a relatively casual setting and finally get to taste at least a little bite of his food! I also enjoyed seeing him win the finale of "Top Chef Masters" after coming home in August. Bayless smartly stuck with the southwestern cuisine he knows so well during the competition. His final meal for the show included a mole sauce that seemed to particularly wow the judges. 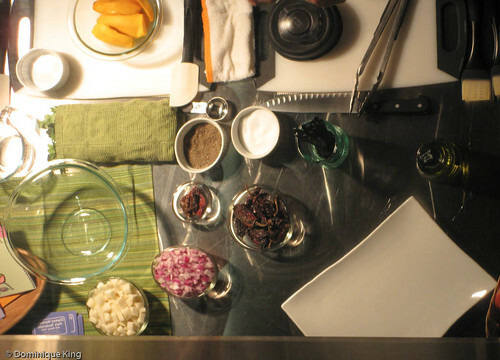 Now, if only I could get back to Chicago and enjoy some of the mole sauce myself! We wandered a few blocks south on Michigan Avenue after leaving the Travel Blogger Exchange conference late last month and found something of special interest to travelers a few blocks away from our conference venue at the Chicago Cultural Center. 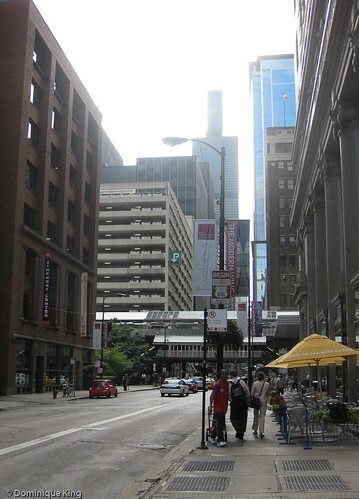 The intersection of Adams and Michigan in downtown Chicago may look like an ordinary city streetscape to many folks, but look a little more closely. Yes, this is marked as the official starting point of one of this country’s most storied highways—and one that captured the imaginations of travelers over the years yearning to head west to wend their way to California. 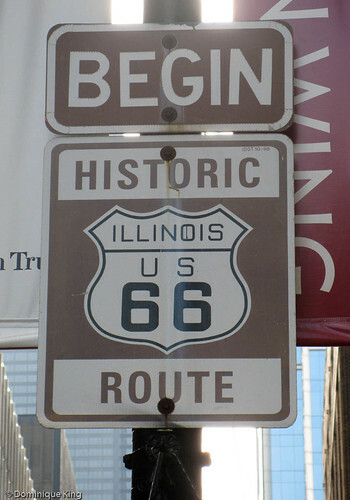 Bobby Troup gave voice to the optimism and the urge to live their dreams many travelers felt during the highway’s heyday with his song, “(Get Your Kicks On) Route 66”. Nat King Cole first recorded Troup’s song in 1946. An eclectic collection of musicians throughout the years that included the Rolling Stones, Depeche Mode, Buckwheat Zydeco and Natalie Cole covered the song as well. My own fascination with Route 66 began when my mom became a regular viewer of the 1960s show of the same name, which starred Martin Milner and George Maharis as two drifters traveling the road in a sporty Corvette. The show filmed in 40 different states during its 1960-64 run and portrayed its starring duo as socially conscious and exploring the quickly changing times as they searched for their place in the world (it was the 1960s, remember?). I was too young to really grasp the social issues raised in the show, but I certainly remember that spiffy car and catchy theme song! The highway became roadkill as high-speed expressways bypassed and supplanted highways like Route 66, which originated in the 1920s and ran for 2,400 miles between Chicago and Los Angeles. The route originally began at Michigan Ave. on Jackson Blvd., the now eastbound street just south of Adams. 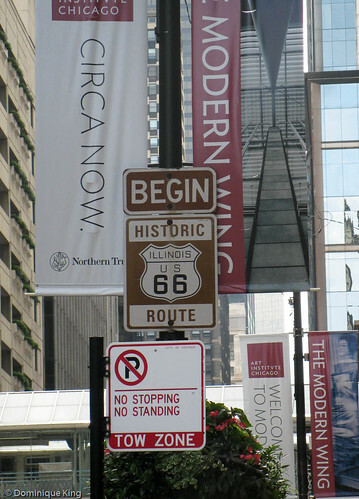 The 1933 world’s fair in Chicago forced the highway’s starting point to move a bit east to Jackson and Lake Shore Dr. Route 66 never officially started on Adams, but today the westbound street bears the designation as official starting point to Historic Route 66. Details, details! I just enjoyed reliving a bit of the sense of romance for the road and great memories that the sign evoked for me.